Another recipe with chinta chiguru. 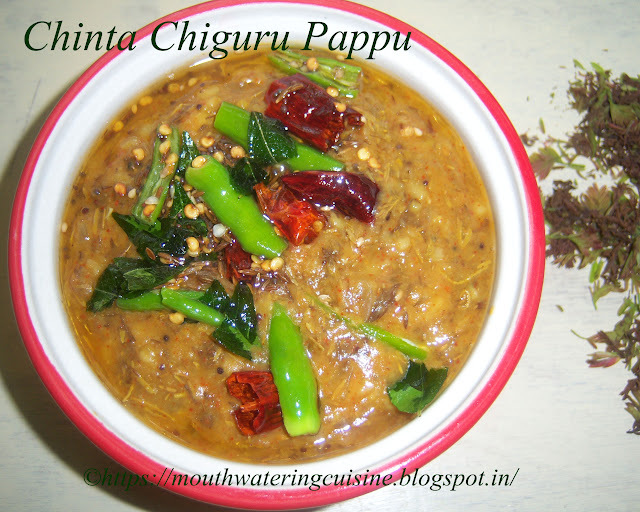 Pappu or dal with chinta chiguru. We get chinta chiguru in this season only. We like this dal with chinta chiguru. We have to clean it in the same way as we do for chinta chiguru podi. So normally we do it at one go and keep the cleansed tender leaves ready to use. First we make one dish and then the other one. Some people make chutney also with it. When I get the next batch I will make that also and post it. It generates heat in the body, so consume less quantity at once. Clean the chinta chiguru as we do it for powder. Keep it aside. Chop onions and peel the skin of garlic. Pressure cook pigeon peas or toor dal for three whistles. Smashing it is optional, normally I did not do for any dal. Heat oil in a deep and thick bottomed kadai. Add mustard seeds, cumin seeds and red chilli. Allow them to splutter. Add garlic cloves and chopped onions. Saute for 2 minutes. When the onions become translucent, add cleansed chinta chiguru. Saute 2 minutes. Add salt, turmeric powder and little water. Let the chiguru cook completely. Once it cooks add red chilli powder and cooked dal. Mix the dal well and allow it to cook for 5 minutes. Temper it with slit green chillies, curry leaves and some tadka. Of course it is optional. As we have already added tadka, we can avoid that. Serve chinta chiguru pappu with hot rice and majjiga mirapakayalu or curd chillies. For more dals click here.Thank you for visiting my blog. Hope you liked all my recipes. Any feedback and comments are appreciated.